The world-famous Milk Bar Birthday Cake, now gluten-free and vegan. 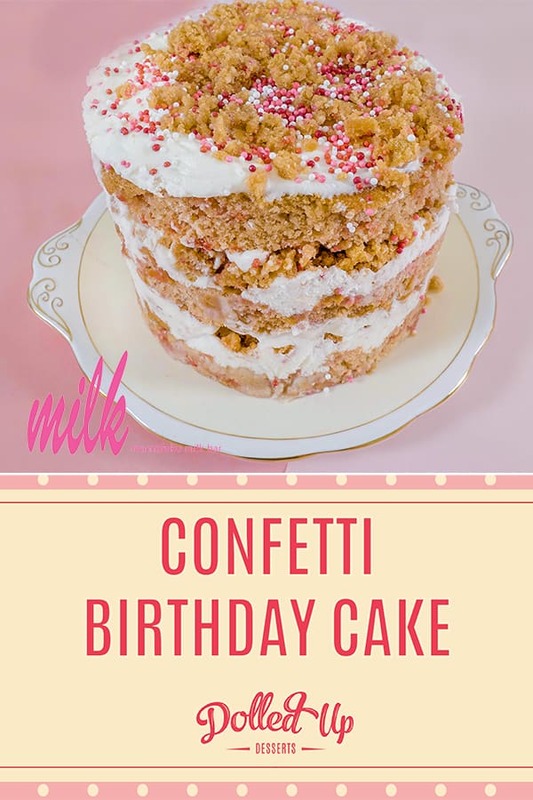 Layers of confetti vanilla cake made with Dolled Up Desserts Cloud Nine Vanilla Cake Mix, smothered in vegan fluffy cream cheese frosting, and topped with the Milk Bar trademark cake crumb. Milk Bar is a New York City hot spot that uses unconventional ingredients to create yummy, imaginative desserts. 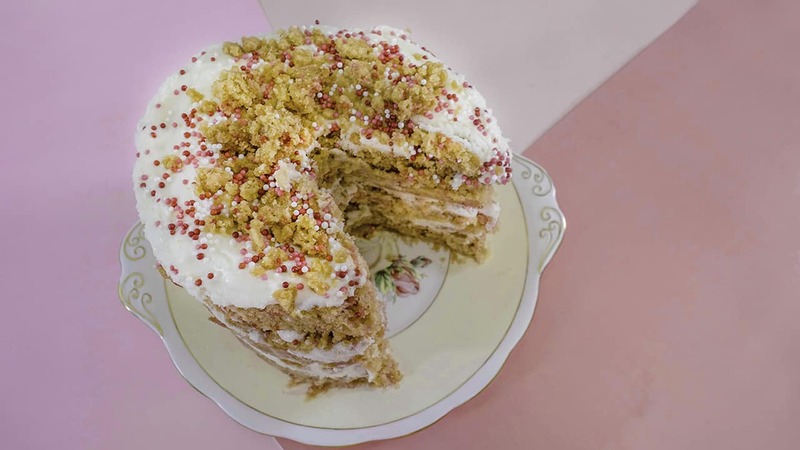 The Milk Bar confetti birthday cake is a well-known treat to New Yorkers. However, since we’re Canadian – and not in Toronto, we don’t really know just how great these treats can be. Also, if we’re vegan and/or gluten-free we probably can’t eat the divine delights that Milk Bar creates. 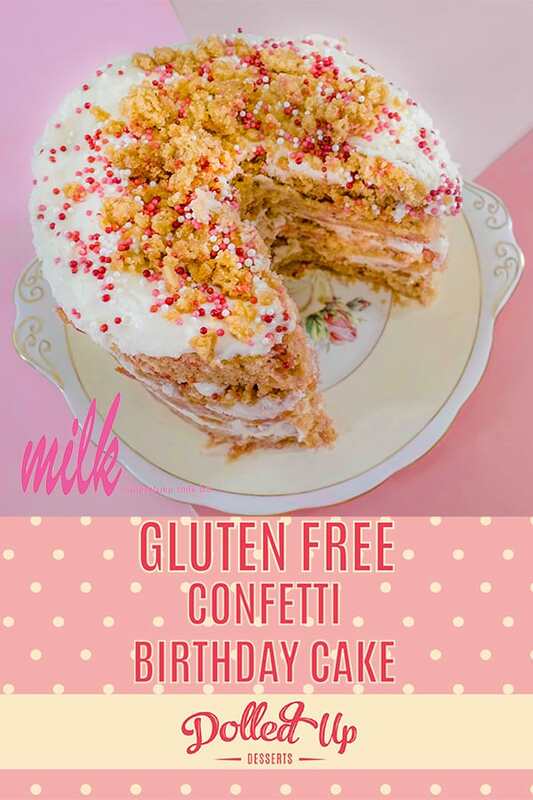 That’s why we tried our hand at our own version of the Milk Bar Confetti Cake for my birthday. Instead of using the typical rainbow sprinkles used in classic, fun birthday cakes, we used pink because we’re Dolled Up Desserts. Would you expect anything else from us? I am a huge fan of Christina Tosi, creator of Milk Bar. I almost feel a sense of camaraderie with Tosi because she really wanted to make desserts “for the people.” In making my own creations with Dolled Up Desserts inclusive, I share a common goal with Tosi – to make treats that everyone can eat and enjoy. As much as this cake was for my birthday, it was also an ode to my #bakespiration and my shameless girl crush – it just happens to be absolutely scrumptious too! The world-famous Milk Bar Birthday Cake, now gluten-free and vegan. 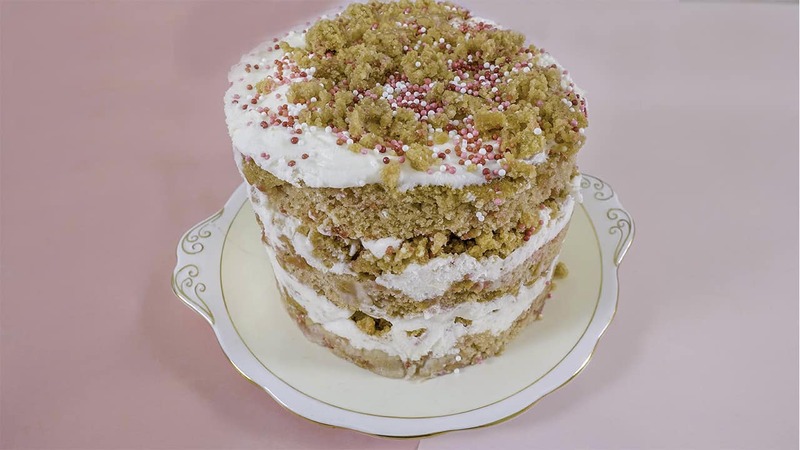 Layers of confetti vanilla cake, and vegan cream cheese frosting topped with the Milk Bar trademark cake crumb. Preheat Oven to 300 F. Line 12-16" cookie sheet with parchment. Mix dry ingredients in a stand mixer. Then add in wet ingredients until the mixture resembles big clumps, or crumbs. Put crumbs into a parchment lined pan and bake for 20 mins. Break the clumps once or twice while baking to get desired effect. Allow crumbs to completely cool. Preheat oven to 350 F. Line 16" cookie sheet with parchment paper. Combine non-dairy butter, shortening, sugar and ½ teaspoon of xanthan gum in stand mixer on medium high speed, while scraping sides to make the mixture nice and fluffy. Add in wet ingredients: combination of milk, oil, apple cider vinegar and vanilla extract. 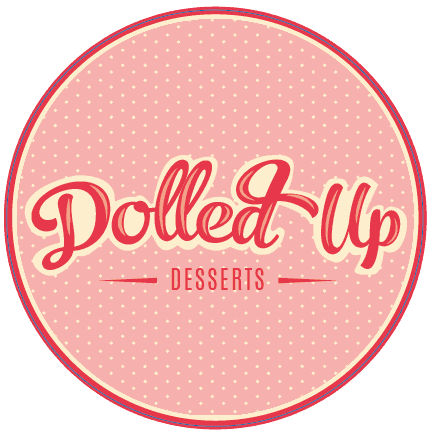 Add in Dolled Up Desserts Cloud Nine Vanilla Cake Mix. Mix at low speed, and add in sprinkles. Pour cake batter into pan and add more sprinkles on top. Bake for 30-35 minutes and let cool. Cream together non-dairy butter and shortening on high speed. Add in glucose and vanilla extract while ingredients are creaming. Once ingredients are creamy, add in icing sugar, salt, baking powder and citric acid. Beat on low speed until combined. Cut cake into circular shapes using the cake pan or 6" cake rings. Save remainder of cake to make the bottom layer of your Confetti Cake. Wet the sides of a circular cake tin and line all sides and base with parchment paper. Wetting the tin will make the paper stick to the side of the tin. Squish remnants of the cake into the bottom layer of the pan. Pour a portion of Vanilla soak over to moisten cake. Top with 1/5 of your icing using a spatula. Put the cake crumbs on top of icing and squish them down into the icing. Top crumbs with more icing. Top with layer of cake, pour vanilla soak again. Top your cake with icing and cake crumbs. Remember to push crumbs down and top with more icing. Put the final layer of cake on top and add remainder of icing. Put some cake crumbs and sprinkles on top to "doll it up". Freeze cake for a minimum of 12 hours. Place your frozen cake tin in hot water for 30 seconds. This will increase the size of the metal pan ever so slightly so your cake can come out easily. Place a parchment lined plate or cutting board on top of the cake. Carefully flip the cake upside down onto the board, and back again to be upright. Place your cake on a plate, or a cake stand. Remove parchment paper and serve. 2 x 6" cake tins* for this method specifically. We used the cake tin as reinforcement. The original recipe calls for cake rings and acetate paper (who has time and money for that!). If you are not consuming the cake immediately, keep it frozen for up to 6 weeks. To store a half eaten cake, place in the fridge covered in plastic wrap or tupperware for 2 days. Store in the freezer for up to 6 weeks.